Dinu Logoz had been one of the cornerstones in the Swiss blues scene for more than thirty years and surely one of the genuine masters of the Bluesharp in his country. He recorded and toured with Freeway 75, Champion Jack Dupree, Driving Wheel, Obeljam, Travis Haddix and The Harlem Ramblers (gigs and tours in Switzerland and in Ohio USA) as well as playing live or recording sessions with Che & Ray, Alexis Homer, Climax Blues Band among many others. Rolf 'LL' Luthi is known as a well-versed guitarist of one of Switzerland's top acts Polo Hofers Sehmetterding and also thanks to his own CD Sunny Side Up, where you can hear the cream of the Swiss blues and rock scene like Polo Hofer, Yvonne Moore, musicians from the groups Span and Bluesaholics as well as Dinu Logoz. But also bands like Rainheart or Soulin' Crash took advantage of his great skills as a guitar player. For more than twelve years Rolf LL Luthi and Dinu logoz have been singing and playing the blues together. 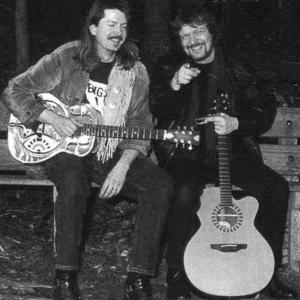 Since ~1996 they have been touring as the unplugged duo ACOUSTIC BLUES BROTHERS throughout the country.